Vanitha is not only one of the most celebrated family magazine, but also a part of the malayali community living all over the world. 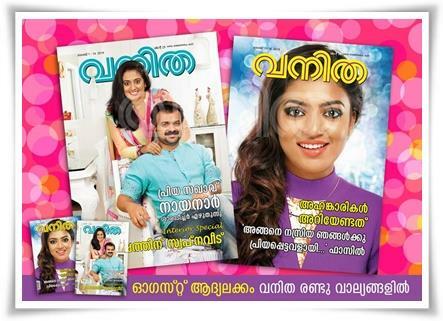 Exclusively designed for the present generation women, The August edition of Vanitha featuring Nazriya Nazim, Kunchacko Boban and Priya on cover has been published. The highlight of August 2014 first issue of Vanitha will be the interviews of actors Kunchacko Boban, Unni Mukundan, Nazriya Nazim and many other interesting stories. In an exclusive chat, actor Kunchacko Boban and his wife Priya speak about their home which has been revamped to the western style. He shares his dreams with the readers. Heartthrob Unni Mukundan reveals some inner stories also about his way to stardom. He invests time to talk about early life and the happiness he enjoys now. Nazriya Nazim, the most popular young actress who has established roots in kollywood shares her marriage plans and future career. Nazriya doesn't want to bring a halt to her filmy career for marriage. She wishes to continue the same after her marriage with actor Fahadh Faasil. An interesting Biriyani recipe prepared by food blog writer Kochu Thresia is another highlight of this issue. Readers can follow the recipe to make tasty Biriyani for the family. Delicious food items including Kabab, Custurd, Biriyani and Sandwich made out of Jackfruit will give insight to the readers. Recipes of 3 puddings featured in the August edition can be one of the favourite. A day with the oarsmen of Sree Ganeshan boat which aims a hatrick in the upcoming Nehru Trophy Boat race is another highlight. A personality development article is also featured in the current issue. It would be encouraged to publish an article on interior decoration. A health related article exclusively prepared for women will serve its purpose. New trends in blouse designs would be quite interesting to read. An exclusive chat with director Faasil and Farhaan Faasil is another highlight of this edition. The journey into the life of Architect Padmasree G Shankar will make the reading community to know more about the man who has made homes with limited budget. Jiji Rajan and Tintu Jacob shares their days in Iraq under the control of the terrorists. Sharadha teacher remembers her good days with E K Nayanar in this issue. Added to these, other regular features will make the readers to get the best from the time invested for reading the magazine. Having a circulation of more than 7 lakhs copies, malayalis cannot miss a single issue of Vanitha. Articles including kids care, Style & Trendy, Astrology, Travel, and Health are also found in this issue of Vanitha. As the most favourite magazine among the family readers, the contents of Vanitha is highly treasured and read by celebrities too. Printed in multi coloured pages, 'Vanitha' is not strictly a women's magazine but widely read by men also. The magazine is recommended for those who wish to stay young and get updated about the world.